It’s a warm spring night, and the darkness has stripped the clouds of soft pink cherry blossom of their colour. The only lights are flickering pools of yellow thrown from oil lamps which illuminate the courtyard of the 15th Century Japanese palace. Visible in their glow are tens of thousands of soldiers in lacquered leather battlegear, their highly polished dou reflecting back the flames. This isn’t the opening of a new Ang Lee film about love and combat during the Warring States period – or Sengoku Jidai (1467-1573) – of Japan. It’s a typical pre-battle sequence from the latest PC game in the Total War series, Shogun 2. Eleven years ago, Horsham-based software developer Creative Assembly took the emerging genre of strategy gaming and redefined it on an epic scale with campaigns that spanned centuries and battles in which you controlled thousands of men. 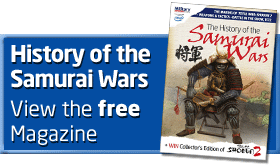 The game, Shogun: Total War, put you in control of one of the families of Sengoku Japan, fighting to rule the country by winning control of one territory at a time from your rivals. Eleven years and five sequels later, Creative Assembly is returning to its original source of inspiration for Shogun 2. Like its predecessor, this is essentially two games in one. You begin looking at a campaign map, from which you must oversee the dynastical ebb and flow of your empire by building cities, recruiting armies and keeping an eye on your heirs. From the same screen, you can deploy special units like ninjas and undercover geisha spies to disrupt your rivals’ progress. When two armies clash, however, the action moves to a 3D battlefield on which you manipulate vast forces of samurai, archers and ashiguru. Up to 50,000 soldiers can be on screen at any one time, but this isn’t about micromanagement: you issue orders to formations, rather than individual units, of men. The atmospheric night time battles are only one of the many ways its technology has improved over the last decade. Every single warrior on the battlefield is as detailed as any character in a game with less ambition, and there are naval, as well as land skirmishes, too. Most importantly for history fans, the simulation is that much closer to real life that real life strategies should prevail. That authenticity isn’t just about visual effects and physics, either. The team is keenly aware that players expect the same attention to historical accuracy too. Audience expectations of Shogun 1 were tempered by the limitations of computer technology at the time, and the fact that there were few English works about the period available. That’s changed, says Simpson, and he expects players to be more aware of any innaccuracies. In order to get their facts right the team refer to original Japanese sources and consult with Professor Stephen Turnbull of the University of Leeds, one of the leading commentators on the era. His books, like Kawanakajima 1553-1564, have proved invaluable. If you want to find out what it was like to command feudal Japanese army, Shogun 2 will be available from 15th March. Start polishing your katanas and wakizashis now. Over the course of developing the last few Total War games, The Creative Assembly has also been nurturing a relationship with the technology leader Intel. It a mutually beneficial arrangement: Intel gets to see what games developers really need, while software architects get expert advice on improving their code. There are benefits to the relationship for strategy fans too. Achieving such enormous amounts of detail at frame rates that are good for gaming is hard, and Intel engineers have worked with the Shogun 2 team to help them enhance the game for its 2nd Generation Intel® CoreTM processor family. More importantly, the game developers have had access to a suite of Intel’s tools such as the Graphics Performance Analyzers, which they say have enabled them to deliver great gameplay on PCs ranging from entry level to todays most powerful – an important design (and business) consideration, since this designing for great gameplay on a range of PCs means more customers. So if you own a powerful gaming PC, you’ll see an incredible amount of realism in Total War : Shogun 2. But if you want to play ‘on the go’ with a mobile PC, or even an entry level machine, don’t worry: you won’t be excluded from the fun.